MELBOURNE, Australia — It doesn't really bother Sebastian Vettel that he'll be starting the Australian Grand Prix from the second row of the grid. He won the Formula One season opener the previous two years despite starting behind Lewis Hamilton, who on Saturday extended his habit of taking pole position in Australia to a sixth successive year. The four-time world champion is aiming for a third consecutive Australian GP title and fourth overall at Albert Park — both records held by the F1 great and fellow German. "I am not too worried. I know we have a great car," Vettel said. "And we've done it before around here." 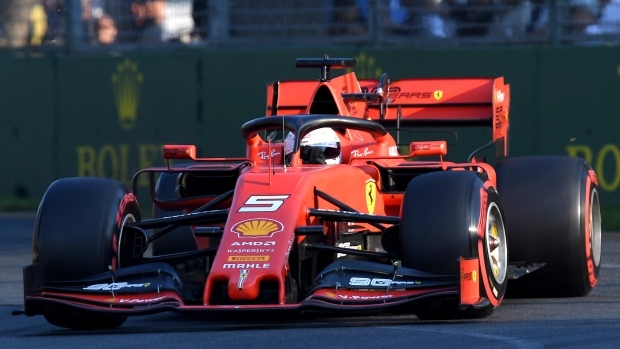 Ferrari drivers Vettel and Charles Leclerc appeared to be the fastest in winter testing, but have so far trailed Hamilton's Mercedes in all three practice sessions and in qualifying in Melbourne. It took a lap record of the circuit in the final seconds of qualifying for Hamilton, the five-time and defending world champion, to edge teammate Valtteri Bottas for pole position. Vettel skidded off the track in Q2 but recovered quickly to finish third in qualifying, 0.704 seconds behind. Leclerc slipped from first in Q1 to third in Q2 to fifth in Q3 when Red Bull's Max Verstappen moved into fourth between the Ferrari pair. Vettel joked about his little off-road rally but said it didn't hurt the car, "fortunately, Q3 was fine ... didn't affect our qualifying." He said the speed of the Mercedes was more than anyone had expected so early in the season but thinks the Ferraris are set to get quicker. Mercedes has produced the drivers' championship winner for the last five years despite Ferrari sometimes having the faster cars, and it's something Vettel wants to reverse in 2019. "The gap is there today and was a surprise, but our focus is tomorrow and (we) don't worry about the gap now," Vettel said. "Clearly Mercedes is favourite ... (but) with 58 laps, we have some time to get a proper read on where we are."